At the gem shop, have you ever picked up a piece of malachite and found that part of the stone was a deep, mesmerizing blue? If so, you may have actually been looking at a specimen which contained azurite. Azurite and malachite are often found together, but between the two, malachite is far more common. 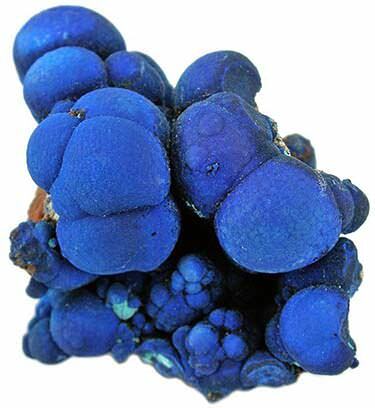 Azurite is one of the two basic copper carbonate minerals found in nature. Not coincidentally, malachite is the other. Malachite is a bright green gemstone, while azurite always has that characteristic deep blue which inspired its name. What is the connection between the two? Azurite, as it turns out, is unstable when exposed to air. Over time, it is weathered and replaced pseudomorphically by malachite. This happens as carbon dioxide molecules in azurite are replaced with water molecules. In raw form, azurite tends to form monoclinic crystals. They can be quite striking to behold, which is why many collectors prize azurite in its natural state. Azurite is very soft, rating only a 3.4-4 on the Mohs scale of hardness. Azurite is highly susceptible to heat, and may even be destroyed by it, yet another reason it is relatively rare. Azurite crystals have a glassy luster and may be transparent or translucent. By far the most famous quality associated with azurite is its remarkable color. Azurite has a rich history and has been described as early as ancient Roman times. Pliny the Elder wrote about it in Natural History, referring to it as “kuanos.” This word is Greek and translates to “deep blue.” He also referred to it as “caeruleum,” a Latin word which pertained to the sea, the sky, rivers, and anything deep blue or green. The modern name “azurite” is derived from the Arabic لازورد lāzaward, this derived from the Persian لاژوردlāžaward. This word referred to lapis lazuli, another deep blue stone, as well as a region where it was commonly mined. We also derive the word “azure” from the same source. Azure is a deep, bright, clear blue color which is roughly the color of the sky on a clear day. Incidentally, this name is slightly misleading, as azurite tends to be a much deeper, darker blue, closer to the sky at twilight. Often, however, azurite features lighter blue bands which are closer in color to a true azure. Azurite used to be popular as a blue pigment (more on that later in the history section). Nowadays, it is most popular for gemstone collectors and jewelers. Since azurite is so soft and unstable, it is tricky to work with and to protect. For this reason, even though azurite is a coveted stone, it is hard to find, particularly compared to its more common cousin, malachite. There is one more indirect use that is worth mentioning, which is prospecting. 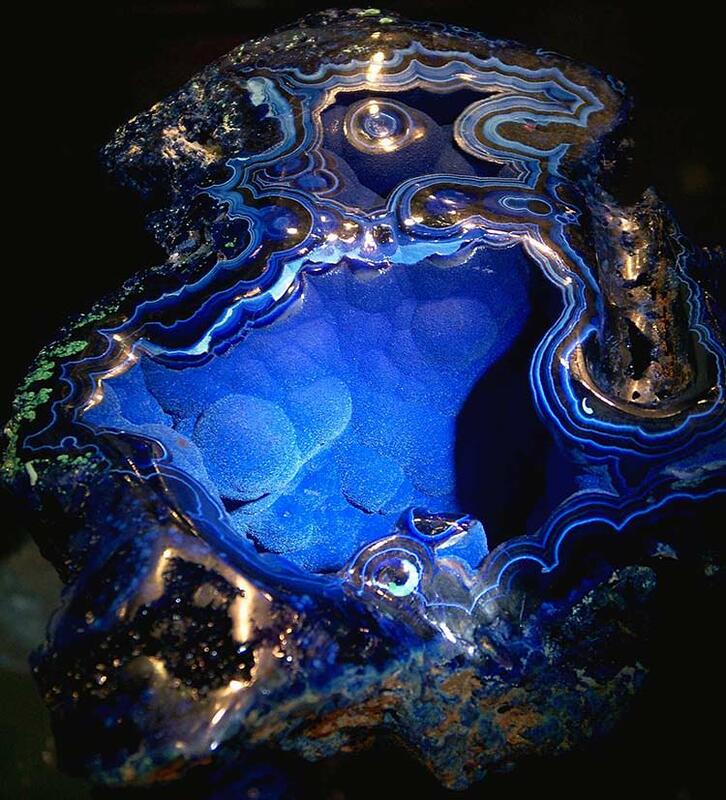 Azurite is often found along with malachite in copper ore deposits. Prospectors will sometimes be alerted to the presence of a deposit when they glimpse that recognizable blue and green. Azurite is easy to confuse with a number of similar-looking deep blue minerals, so be sure to check out the section on similar minerals before you go out shopping. That way you are less likely to buy another gemstone being passed off as azurite on mistake (you are more likely to mix up the stones if they are polished and tumbled). The price you pay for azurite can range wildly. You can purchase a pound of azurite in its raw form for $50-$150, but generally it will have a great deal of malachite in it. A relatively pure, large azurite in raw form could cost you thousands of dollars. Basically, the purer the stone, the higher its value. Even a relatively small raw piece of pure azurite could cost you $20-$60. Small tumbled specimens will have a similar price. If there’s a lot of malachite in them, they may cost only a few dollars. As mentioned previously, azurite is really hard to work with because it is so fragile and can so easily be altered or destroyed. Azurite jewelry typically features raw or tumbled stones. Raw stones usually feature very minimal settings, designed to showcase the unique shapes of the specimens. Tumbled stones are usually polished, but often not with quite the shine you may be used to seeing. You should expect to see a lot of pieces which feature quite a bit of malachite along with the azurite. Can you buy faceted azurite jewelry? In spite of the fact that transparency does feature in many azurite crystals, azurite is not all that great for faceting. Too many azurite crystals are too small, cloudy, or feature too many bands of color or malachite. This is why you will not find jewelry with clear, sparkling, faceted azurite centerpieces. 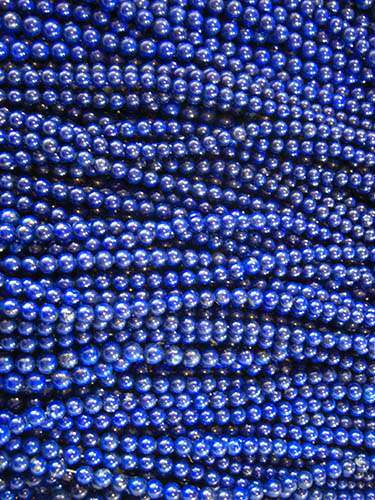 Faceting is commonly used to create azurite beads, but these beads usually are translucent or opaque. They generally contain a number of different colors, and are used for stringing. This hasn’t stopped adventurous jewelers from attempting to create azurite engagement rings, however. In fact, the famous American celebrity jeweler David Webb (who worked with Jacqueline Kennedy and Elizabeth Taylor, among others) has created some very unique pieces. You can still find some of David Webb’s azurite wedding bands for re-sale. As they are designer pieces, they are very expensive, costing tens of thousands of dollars. If you are curious, most of these pieces feature solid bands of azurite and/or malachite carved beautifully and adorned on both sides with small diamonds. These really are very distinctive, quite different from anything else you have likely ever seen. Azurite is a beautiful gemstone. In terms of color, it is very eye-catching. Many people also like the way the blue color looks interspersed with the green of malachite. Since azurite is not all that common, especially for jewelry, giving it can make quite a statement. This is especially true if you are purchasing a designer piece of wedding jewelry for your partner. You do not have a lot of options. With other gemstones that are more commonly used for jewelry design, you can choose from numerous different styles and settings. You will not have nearly as many choices when it comes to azurite. Azurite jewelry does not shimmer and shine like diamond. Some people do not like this look, and would prefer something with a little more sparkle. Azurite is not traditional for weddings. Some recipients will only be happy with a diamond, so always double check. 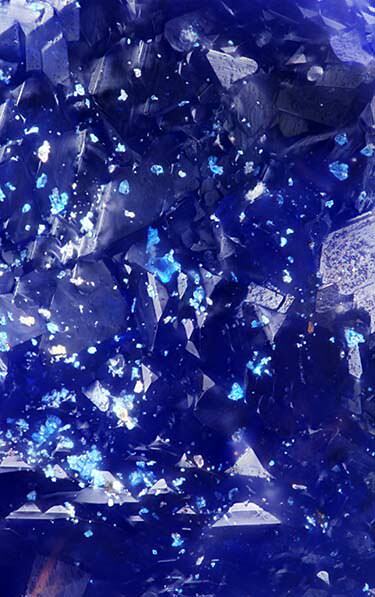 While the color of azurite is beautiful, it may not be preferable to everyone. Your recipient may prefer a color that is more neutral and will match more of her clothing, or one that may be a better match for her skin tone. Azurite is fragile. Because of this, it can be hard to care for. It is easy to break if dropped, and it may get scratched or easily chip. For that reason it may not make the best choice for a ring that your recipient will wear every day. Plus, exposure to heat and light will cause substantial damage over time. 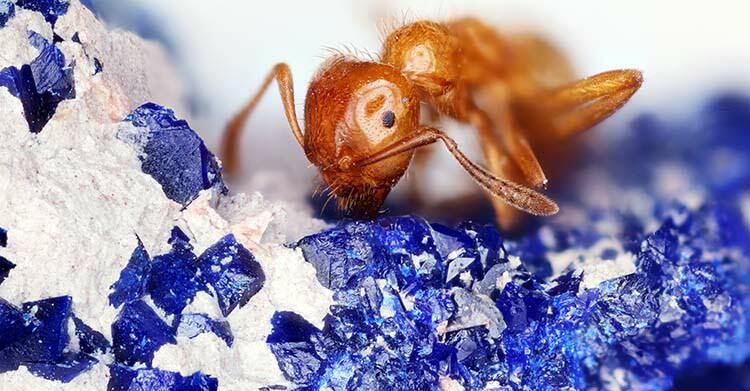 Cleaning Azurite: This is a task to be undertaken with great care. Because azurite is so soft, damaging it is almost effortless. You can avoid scratches by taking a very gentle approach. Begin by soaking your specimen in water for a few minutes. This will help to dislodge some of the dirt and grime you are trying to clean out. Remove the specimen from the water and scrub it very gently using a soft-bristled brush (like an old toothbrush). Use mild soap only, nothing abrasive or harsh. Then rinse the stone again. Be sure that all the soap residue is removed before allowing the piece to air dry. Storing Azurite: The goal is to prevent damage to your piece. You can do this by storing azurite separately from other jewelry. You should keep azurite inside a soft pouch or inside its own padded jewelry box. This will keep other pieces from rubbing up against it. Never store azurite in direct sunlight or in excessive heat. Remember that azurite is not only soft, but unstable. Exposure to sun and heat will damage the stone, not just alter its appearance. Wearing Azurite: Azurite is not the ideal gemstone for everyday wear. You have to take it off any time you are doing anything active. That means if you have an azurite wedding ring, you need to remove it every time you work with your hands. Never wear it when you are cleaning house with chemicals, and make sure you do not have it on when you are applying makeup, hair spray, and other cosmetics. Wait until you are done to put azurite on. As we talked about earlier when discussing the etymology of “azurite,” this is a gemstone with a rich history dating back to antiquity. It is easy for historians to trace its usage over time. Presently, azurite’s only uses are in jewelry and collecting. The gemstone is prized for its beauty and its rarity is appreciated. 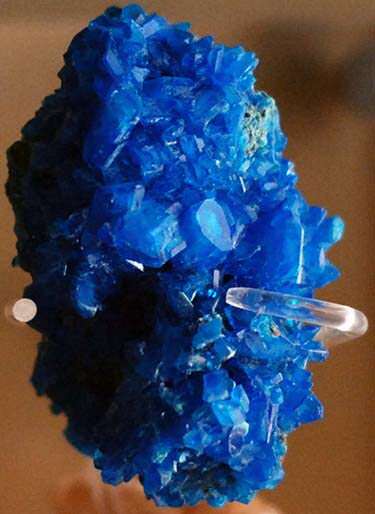 Historically, however, azurite had an industrial use as a dye. Thanks to the differences in azurite’s natural coloration, it was capable of producing a range of different blues. The pigment has been given a variety of names throughout its history. Several of these include Armenian stone, mountain blue, and Azurro Della Magna. The blue pigment was commonly used in paints. There has been some confusion in the past between azurite and lapis lazuli. It is now known for example that in the Middle Ages, azurite was far more common in Europe than lapis lazuli, which was mined in Afghanistan. We now know that many paintings which were originally believed to contain lapis lazuli pigments actually were created using pigments made from azurite. The pigment made from lapis lazuli is called ultramarine. The two may sometimes appear quite close in color, but heat can be used to tell them apart. If you expose ultramarine pigment to heat, it holds up to the treatment and retains its original hue. Azurite, as you might expect, becomes damaged, and converts into black copper oxide. Interestingly, azurite is sometimes heated with care to produce a deeper blue hue. If this process is done very gently, the pigment does not turn black. 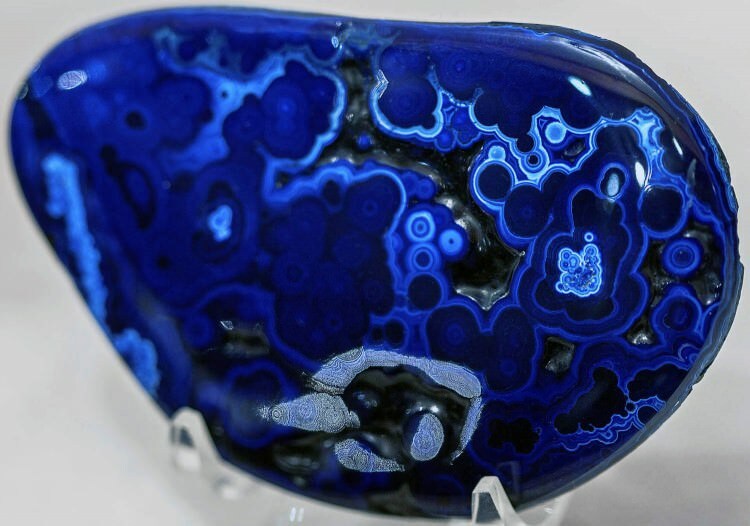 When azurite pigment is mixed with oil, it takes on a greenish cast. If it is mixed with egg yolks, it becomes greenish-gray. Sometimes you may stumble across pieces of art which contain a greenish form of azurite pigment which is a result of age. These older pieces have weathered, and the azurite in the paint has begun the process of pseudomorphing into malachite. Over time, this process will continue. 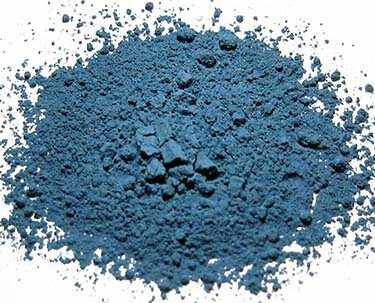 Nowadays we have access to many other sources of blue pigment, so it is no longer necessary to crush azurite into powder. Instead we can use it for jewelry or display it in its raw crystal form. There is another very interesting story about azurite, malachite, and nickel which concerns how nickel got its name. There is an ore of nickel known as “nickeline.” This ore weathers into a green mineral, just as azurite does. Whereas azurite weathers into malachite, nickeline weathers into annabergite. Because these two look quite similar, attempts were made in the past to smelt nickeline in the hopes that doing so would produce copper ore (think back to the earlier discussion of azurite and malachite an copper ore prospecting). This never worked, of course, since nickeline is obviously not an ore of copper. Furthermore, it takes very high smelting temperatures to successfully reduce nickel. Frustrated German smelters coined the name “kupfernickel” for this substance, which translates to “copper demon.” It wasn’t until 1751 when Swedish alchemist Baron Axel Fredrik Cronstedt realized something else was afoot. 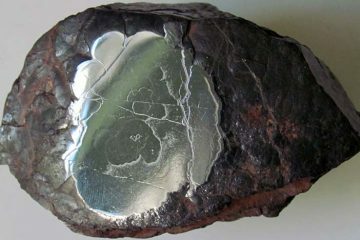 Nickel was not entirely unknown at that time; a few researchers had encountered it in meteorites. But it was Cronstedt who finally identified it as a metal found in the earth and managed to differentiate it from copper ore. He was the one who named it “nickel,” inspired by the original “kupfernickel.” So now you know how nickel got its name—through a case of mistaken identity! Despite being a strong blue color (rather than an indigo hue), azurite is typically associated in metaphysical practice with the third eye chakra (not the throat chakra as you might expect). As such, its associated meanings include intuition and spiritual insight. Practitioners wear or carry azurite to connect to higher spiritual planes and chart a course through dreams or the future. Aside from that, azurite is commonly associated with artistry for the simple reason that it used to be used as a pigment. Since it is not the most well-known stone, there are not a lot of other meanings which are readily associated with it. Because of its name and its deep blue color, it is sometimes linked with the sky. Azurite with malachite from the Milpillas Mine in Sonora, Mexico. There are some gemstones which are so distinctive that you couldn’t possibly mix them up with others. Azurite isn’t one of them. While azurite is a beautiful gemstone with a deep, extraordinary color, there are actually quite a few other blue gemstones which also form vitreous crystals. Malachite: You would never confuse malachite with azurite since it has a bright green color and looks nothing like it, but it is worth mentioning briefly since you will often find the two in conjunction with each other, and they are closely related. Because malachite is the endpoint of azurite weathering and not vice versa, malachite is the more common gemstone. Linarite: This beautiful deep blue stone would be very easy to confuse with azurite. 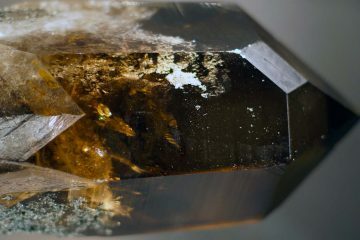 It is softer, measuring only a 2-3 on the Mohs scale of hardness, and is also heavier than linarite. One distinguishing trait is that it doesn’t effervesce when exposed to hydrochloric acid. Lirconite: This gemstone also looks quite similar to azurite, but it can be distinguished by its lighter blue color. Whereas azurite is quite a deep blue, lirconite is closer to the color of the sky at midday. Remember, even though azurite is named for the azure color of an afternoon sky, its hue is actually closer to twilight. Lirconite is also a warmer blue—it has a slightly greenish tint to it. Azurite is a much colder color. Connelite: This is another blue mineral which doesn’t effervesce when it is exposed to hydrochloric acid. 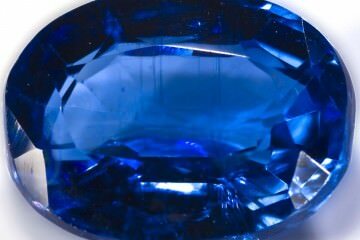 It is usually a lighter blue in color than azurite, and warmer on the spectrum toward the greenish side. 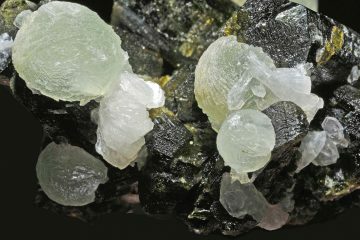 Connelite stands out because of its very distinctive formation. The mineral forms long, spindly crystals, almost giving the impression of a sea urchin. Chalcanthite: This is a bright blue crystal, close in color to azurite but usually a couple shades lighter. Interestingly enough, this mineral is poisonous. If you were to taste it with your tongue, you would actually be endangering your life. Also interesting, if you get the residue on your skin, it can stain it blue for days. Cyanotrichite: This gemstone, like chalcanthite, is a lighter blue than azurite. Also in the manner of chalcanthite, it forms long, spindly crystals. These crystals are so fine that they contributed to the name of the mineral, which comes from the Greek for “blue” and “hair.” It would be incredibly easy to confuse with chalcanthite. Because of the distinctive formations, however, you would be unlikely to confuse it with azurite in its raw form. Cornetite: This gemstone does not effervesce in hydrochloric acid, and is a warmer, greenish shade of blue than azurite. Lazurite: This mineral also does not effervesce in hydrochloric acid. 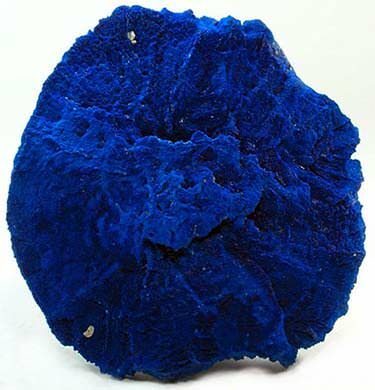 In terms of color, it is quite similar to azurite, but the crystals form with a distinct blocky shape. This means that in its raw form, it is fairly easy to distinguish from azurite. Now you know all about azurite. While this gemstone was perhaps better known historically because of its use in pigments, it should have a special place today on any collector’s shelf.